Update: click here for the full album review, and all the tracks on YouTube. Update #2: click here for “Penny Drops” – the Bside to “In Cythera”. 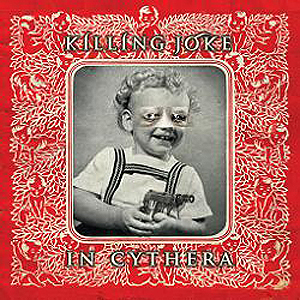 Well, when I say announced… I can only find it – an “In Cythera” single – listed at “What Records”, but a promo video has also surfaced so it looks like this is the first single off the new Killing Joke LP – MMXII (2012), out on 2nd April. It lists the release date for the single as 26th March 2012. The “What Records” site lists a CD single (£4.99, numbered in red, limited to 200 copies), coloured vinyl 12 inch (£14.99, numbered in red, limited to 200 copies) and a dual pack (CD & 12 inch, £14.99, numbered in blue, limited to 799 copies). Note: The stuff back there in brackets comes from the store website so maybe treat with caution – that doesn’t add up to many records/CDs, although all releases are listed as limited. Ho hum. the “In Cythera” video is not available to me as I have to go through a German proxy and YouTube/Vemo will not allow me to watch it “not available in your country” crap. For a band who so keenly aware of the idiocies and corruption of global corporations this is marvellously ironic. Indeed, and an irony Jaz would be proud of. I’m sure if you pay Murdoch enough he’ll sort out a way!